"Where all our customers are satisfied, because those are the ones we allow to live!" Anyway, I'll be leaving a Minions at Work cartoon set to go for you folks next week, but it may or may not go out exactly on schedule, depending on my internet access at the time. Lets face it, a Las Vegas casino is kind of like a lair with more neon and better access to out-call escorts. Heck, it even has evil masterminds watching your every move through hidden cameras, and a plot to part the unsuspecting from their money and to get away with it Scott-free. From a villain's standpoint, you've got just got to admire the whole operation. So consider it Minions at Work research too. So, we're off. And don't worry about Number Two folks. He's got more lives than a cockroach, and twice as much resistance to DDT. He'll be fine just as soon as they reattach his legs. And that will happen just as soon as they find them. See you (remotely), next week. LOL! 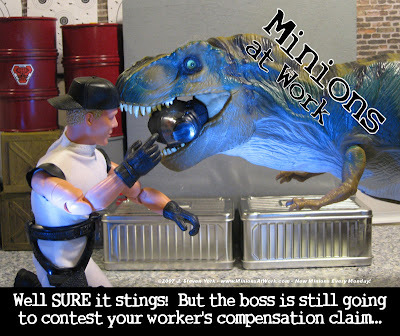 Now wait a minute, which one filed for worker's comp, No.2 or the T-Rex?